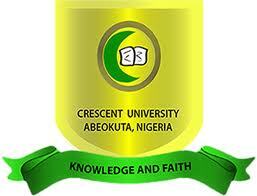 Crescent University Post UTME Latest Update: We invite all UTME/DE candidates interested in 2018/2019 ADMISSIONS into Crescent University Abeokuta to apply now and come for screening on *Saturday 14th July, 2018* on the University campus starting from 9.00am. Please note that screening will continue on daily basis after the day till resumption. Crescent University, CUAB Post UTME / Direct Entry screening application form for the 2018/2019 academic session is out. The cost of Cresent University undergraduate programmes admission form is = Seven Thousand Three Hundred Naira only (₦7,300.00). See also: Crescent University School Fees Schedule. admissions@cuab.edu.ng or info@cuab.edu.ng or call: 08030644731, 08027814584 (For Whatsapp Msgs only: 08027814584). I had my A level result I need admission into 200level.how are my going to do it?